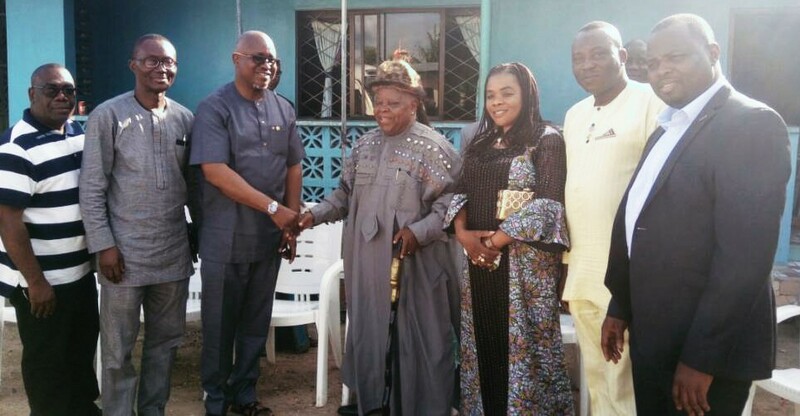 From left: A member of the Governing Board, Nigerian Council of Registered Insurance Brokers, Mr Sunday Malomo; Executive Secretary/CEO, Mr Fatai Adegbenro; President, Mr Shola Tinubu in handshake with Nsobom of Uyo Kingdom, His Royal Majesty Edidem Sylvanus Okon; Deputy President, Mrs Bola Onigbogi; Honorary Auditor, Mr Tunde Oguntade and Executive Director, AIICO Insurance, Mr Lawal Kadri during a courtesy visit of the Council to the Paramount Ruler of Uyo to mark the opening of 2018 CEOs’ Retreat of the Council, held in Uyo, Akwa-Ibom State. I would start by commending your President Shola Tinubu and his team for putting this retreat together especially, according to what I hear some of you often say “at these very trying period”. ritten Premium of the industry has hovered between N300bn – N320bn. What this signifies is that the figures are not growing in the same proportion if the enormous potential at the disposal of the sector is to be used as benchmark. Nigeria, according to the 2017 world population records, is designated as the seventh most populous country in the world accounting for 2.6% of the world population; this translates into Nigeria being the world’s most populous black nation. Again, Nigeria is the 21st largest economy of the world in Gross Domestic Product (GDP) terms and the largest economy in Africa. However, a cursory overview on the access to financial services in Nigeria indicates that there is a huge deficit in terms of financial inclusion to which insurance is a veritable part. Statistical analysis indicates that Nigeria requires aggressive and strategic developmental efforts towards reaping the benefits of her abundant potentials. This has become an imperative rather than an option if ordinary Nigerians who have no access to financial services must be brought to the fold. Haven taken due cognizance of these indices, NAICOM over the years had taken steps to create the legal framework and enabling environment for insurance business to thrive in Nigeria. Thus, the Commission had evolved several market development initiatives and platform to upscale insurance awareness and access, channels of distribution, product development to guarantee a stronger and viable insurance sector in Nigeria. The Commission expects the industry operators particularly, Brokers and Underwriters to continuously take advantage of these initiatives to grow not just their respective business but the industry. The choice of your core theme for this forum, “The Future Broker” is particularly apt and adequate which I believe is designed to perhaps midwife the rebirth of a new insurance broking segment of the industry. I am glad that you have chosen this theme out of your own volition and expect that you will be sincere to yourselves in discussing the key issues surrounding it. It is pertinent for me to advice at this point that in discussing “The Future Broker”, it is imperative for you to first and foremost, x-ray the past and present broker to ascertain its sound state of health. I say this because it is until you are able to diagnose the specific ailment inhibiting the good health of the present broker, it might be difficult to give the accurate prescription and dosage for the future broker of your dream. Suffice it to say then that the place of “The Future Broker” in the Nigerian insurance sector is without doubt hinged on the successful and accurate diagnosis of the ailment of the present broker and the administration of the right prescription/dosage else, your exercise here today would be in futility. You should be able to honestly identify what must change in the prevailing structure and resolve to collectively walk the talk. From a regulatory perspective I can give you a few diagnostic analysis which your retreat could find the real ailment for and then hopefully would prescribe the appropriate medication for an immediate cure. The typical Nigerian Insurance Broker is unprofessional and does not care about the “big picture”. He lacks confidence possibly because he does not trust his ability. He lacks the spirit of adventure because he has refused to develop himself. And he allows himself to be hijacked by other non-professionals as investors for reason I can not fathom. Our approach to regulation has been an interactive one. We encouraged self regulation where feasible. However, this was sometimes ago misconstrued as a license for statutory independence. This is a misnomer in any clime. We urge the working together of all arms of our sector to ensure synergy, that too is ignored by the “we’ll do it alone” tendencies we observe in most market initiatives, especially from your council members. This is not healthy, “the Future Broker” must address it and find a way to be part of the future market. It is crucial for all stakeholders in the industry to begin to evolve strategies for exploiting the retail end of the market. It is no gainsaying the future of the industry will depend more on retail rather than corporate businesses. According to statistical reports, the Nigerian adult population which consists of people from 18 years and above is 96.4 million, out of which 59.6 million are living in the rural areas. Among this rural populace, 40.1 million are excluded from any form of financial services. Additionally, the Nigerian formal sector provides income to only 7.9 million adults, representing 4.2%, whereas 41.6% are excluded from financial services, including insurance. This offers a huge opportunity for “the future broker” to provide desirable services to close these existing gaps and enhance the general performance of the industry. For us at the National Insurance Commission (NAICOM), let me re-emphasize our commitment towards driving the Nigeria insurance industry to greater heights by providing strategic and far reaching regulatory frameworks and market development initiatives in accordance with extant laws and best practices. The Commission specifically introduced Microinsurance, including Takaful products in the Country as an attempt to address the identified existing gaps to aid penetration and as well as reach the segment of the market that was either hitherto unreached or not comfortable with the conventional insurance products. The decision to create additional channels for insurance distribution is also in this light. We are equally optimistic that the expanded distribution channels will in no distant time aid the penetration of insurance in Nigeria and subsequently lead to a substantial leap in the contribution of insurance to the nation’s Gross Domestic Product (GDP). With the recent climatic changes and the menace of floods, storms and outbreak of diseases to our Agricultural produce and livestock, NAICOM is poised to improve its regulatory and supervisory framework to cater for Index Based Agricultural Insurance (IBAI) Products. We believe these are other areas where “the future insurance broker” could also take advantage. In conclusion, let me re-emphasize that beyond creating the enabling legal and regulatory environment for insurance business to thrive in our economy, the prospects and sustainability of the industry heavily depends on the ability of operators to develop the right products that suit the needs of the identified market, efficiently and effectively distribute their products to the various target markets, create adequate awareness to realize delivery of services and meeting expectations of the target customers. For the “Future Broker” in particular, it is imperative to note that the prospects for achieving your important objectives will be more than ever before, enhanced by technology and harmonization of global best practices. To continue to remain relevant in the insurance value-chain in Nigeria, the “Future Broker” must be prepared to change its old toga for a new one that is innovative and technology driven. You must evolve new ways of accessing prospective insurance consumers while at the same time keeping and maintaining existing consumers, ensuring their protection and satisfaction. This is a proven way to guarantee repeat businesses. Against this background, I urge you to exploit the opportunities provided by this forum to get the necessary strategy for efficient and effective service delivery that shall herald the next level of business opportunities for the “Future Broker”. I once again congratulate the leadership of the NCRIB for its initiatives and commitments towards entrenching a solid foundation for not only the insurance broking segment of the industry to thrive but the entire insurance sector of the Nigerian economy. The Commission indeed, strongly believes that it is high time the various players collectively explored the untapped potential of the Nigerian insurance industry for a better economy. I wish you a fruitful retreat.